Chalice 74 can be installed directly from the box into a wide range of ceiling types including thicknesses from 1mm – 25mm. Equipped with a detachable connector which allows an easy and toolfree pre-wiring via push-fit terminal block. 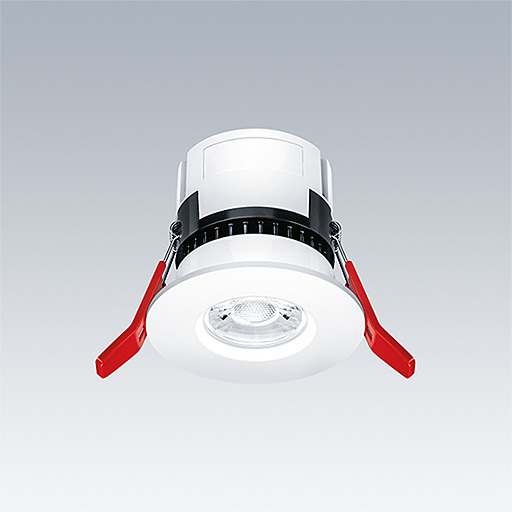 A ceiling recessed, fire-rated, LED downlight with IP65 as standard. Fixed output. Correlated colour temperature is 3000/4000K with CRI>80 and a chromaticity tolerance of 3. Luminaire is available in two lumen packages 550lm and 900lm. Overall height <100mm and a cut out of 74-80mm. Lifetime is 50,000 hours (L70) at Ta 25°C.